Investment News recognizes women who are providing advice through leadership, passion, creativity and willingness to help other women along the way. "Winnie is the perfect example of what we were looking for in our Women to Watch honorees. She not only fits all the criteria but she is vivacious, personable and passionate." says Suzanne Siracuse, publisher of InvestmentNews. InvestmentNews presents these awards to identify women who are distinguished leaders, who are driven, innovators, and willing to share their knowledge and experience to help other women. Winnie runs a successful firm with incredible people, her team, as the driving force. Being a minority in the financial industry is a tough gig, but Winnie is using her knowledge to let other women know it is possible. “When I first started in this industry, I didn’t know that women were such a minority. I grew to learn what a gift and opportunity this was in helping clients in all stages of their financial well-being. The Investment News recognition is incredible and to share the stage with such impressive, generous women is overwhelming.” Winnie articulates. With over 400 nominations for this award, being chosen is quite an honor. Winnie was chosen because her work has already made a lasting impression on the financial industry. She is a notable leader at her firm and has proven her enthusiasm to share her experiences and give back to the industry as a whole. Winnie is known for recognizing the shortage of women in the financial industry and she goes above and beyond to share her expertise by serving as a role model to other female professionals. Winnie is one of the most followed financial advisors on social media today. With more than 16 years of experience in the financial services industry, she is featured as a “top advisor” speaker at national industry events, appears on CNBC’s Closing Bell and Fox Business News as a market commentator, is a regular contributor to Forbes, NerdWallet, is the host of TuneIn radio’s business show Renegade Millionaire, host of the Renegade Mom TV show on Modern Mom, appears on CBS as a finance expert, and is quoted in publications including The Wall Street Journal, CNBC, The New York Times, Yahoo! Finance, AOL Finance, HuffPost LIVE, theStreet TV, USA Today, TheStreet show, Rep Magazine, OnWallstreet Magazine, Financial Planning Magazine, FA Magazine, AdvisorOne Magazine, GreersOC, Orange County Business Journal, Orange County Register, OC Metro, OC Family, and many others. 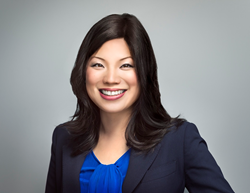 Winnie was previously First Vice President of Wealth Management, Senior Investment Management Specialist, and Lead Financial Advisor for the Sun Group at Morgan Stanley Smith Barney. Her exemplary young team was a premier leader in managing client portfolios and providing professional customized service. Winnie began her investment advisory practice with Salomon Smith Barney where was awarded their highest honors for success with her membership in the elite Blue Chip Council (2001-2004), Century Council, and President’s Council throughout her tenure*. Winnie was also an advising member of the Smith Barney Asian Advisory Council. Prior to entering the financial planning industry Winnie was an entrepreneur. She owned and operated CH Entertainment, which was headquartered in Los Angeles, California. Her firm was a leading television audience production company, with many high profile clients including America’s Funniest Home Videos, Jeopardy!, Wheel of Fortune and Judge Judy. Winnie participated in over 350 television-taping productions, and was a voting member of the Academy of Television Arts & Sciences (Emmys). As an independent wealth advisor and financial planner, Winnie is regularly called upon to educate large corporate and nonprofit groups on planning strategies. Winnie has been honored with invitations to the Barron’s Winner’s Circle for Top Women Financial Advisors beginning in 2006 to present and coined “The Wealth Whisperer” in OC Metro’s “40 under 40” recognition. Media Inquiries may contact Robyn Stevens at prmedia(at)live(dot)com.